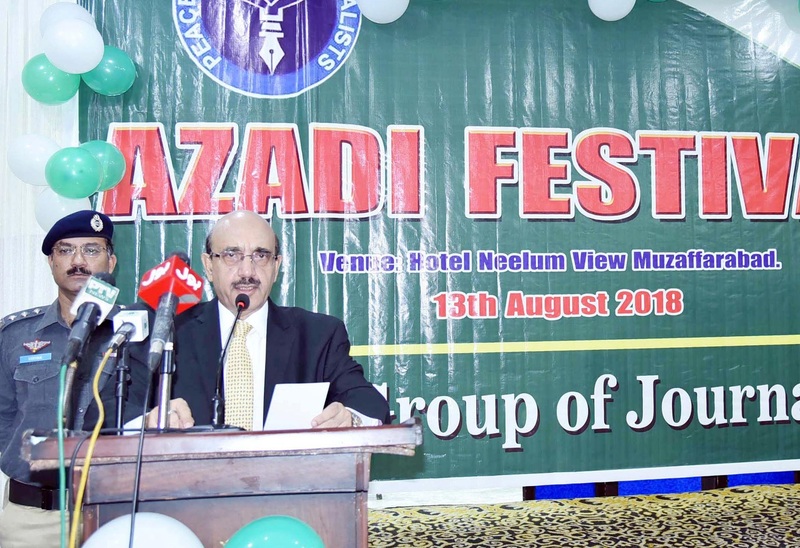 MUZAFFARABAD: Azad Jammu Kashmir (AJK) President Masood Khan has said that Pakistan is incomplete without Kashmir and Kashmir has no identity without Pakistan. “Kashmiris are not only bonded with Pakistan economically, geographically and culturally but their hearts are throbbing with Pakistanis,” he said while addressing an Azadi Festival here on Monday in connection with the 71th Independence Day of Pakistan. Organised by journalists, the festival was attended by high-ranking civil and military officials, city elite from various parts of life besides large number of the children of various schools and residents of the capital city. President Masood said that August 14, 1947, was destination as well beginning of a new journey to make newly-established Pakistan a modern, welfare and prosperous country. He said that this journey would be continued till the objective was achieved. Terming Pakistan as great gift from Almighty Allah, he said that it was the prime responsibility to protect this country and spare no effort to make Pakistan strong and stable in all respect. “We should not forget our brothers and sister in the other side of the Line of Control who are suffering at the hands of the Indian Army,” he said. The Kashmiri president highly appreciated the journalists for organising a beautiful programme to mark the Independence Day and said that the programmes presented by children effectively depicted the sacrifices of the valiant armed forces and struggle of the freedom fighters to achieve the independence. He expressed his hope that the day was not far when all Kashmiri people would also celebrate the Independence Day of Pakistan with freedom. In a message on the occasion of the Independence Day, President Masood said that Pakistan was incomplete without Kashmir both ideologically and geographically. “People of Jammu Kashmir had attached their fate with Pakistan seven year before Pakistan came into being when a representative delegation of the Kashmiri people under the leadership of Ghulam Haider Jandalvi attended the All India Muslim League Working Committee meeting in Lahore that passed Pakistan resolution in 1940,” he said. President Masood urged the people to forge greater unity according to the principles of Father of the Nation Quaid-e-Azam Muhammad Ali Jinnah for safeguarding the integrity and solidarity of the country and success of the Kashmir liberation struggle. He vowed to carry forward the freedom struggle of Kashmir relentlessly to materialise the dream of Quaid-e-Azam and to achieve the real objectives of the struggle for separate homeland for the people of South Asia.